Our chosen courier DPD has lots of options to allow you to get your parcel when and where you want it. Please viisit the DPD website for more information http://www.dpd.co.uk. Our team are committed to trying to offer you the fastest delivery possible. All of our stock except Beefeater BBQ's and Bean bags is kept in our warehouse in Isleworth West London. In fact over 98% of our orders recieved Mon - Thurs before 2pm are delivered next day (mainland UK excluding Scottish Highlands). We can also have your parcel delivered on a Saturday or Sunday. Beefeater BBQ's are delivered directly from the manufacturer and take 3-5 working days for delivery. Beanbags are made to order in the UK, orders recieved before 10am are made and shipped the same day to be received the next working day. Our stock works on a rolling stock system. Once our stock levels reach a minimum level it is re-ordered which 98% of the time guarantees that we will have stock of every item. Unfortunately though, even though our minimum stock level is very high, if the Techmar team in Holland have an issue we can run out of certain items. If there is a problem with any of your order, our team will contact very shortly after your order has been received. Store Pickup The pick up option allows you to pay for your item through the web site before coming down to our showroom in Isleworth, Middlesex to collect your order. We would recommend that you call before picking up your goods to accertain that your order is ready for collection. Collections times are from 8am - 5pm Monday to Friday. Small items such as bulbs and connectors are sent via Royal Mail. This not only helps keep the price down but also allows the items to be posted through your door as there is no signature required. 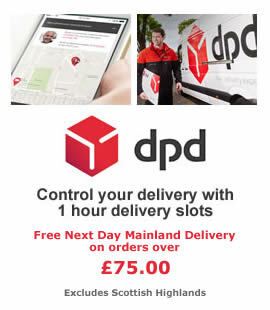 DPD is available in three options for mainland UK, Next Day, Next Day AM and Saturday AM. All orders received before 2pm Mon - Fri are shipped the same day. Orders received after 2pm will be shipped the next working day. If your country is not listed then please contact us. We can arrange for delivery for anywhere in the world. Our last shipping date of 2018 is the 21st December. Orders taken after this will be shipped on the 2nd January 2019. During this period our offices will also be closed.